The entire family will enjoy a delicious buffet prepared by the Yacht’s Executive Chef, while experiencing the best views of Tampa Bay or Clearwater! Looking for a memorable date night this Valentine’s Day? Dine aboard Yacht StarShip for a romantic lunch, dinner or dessert cruise! 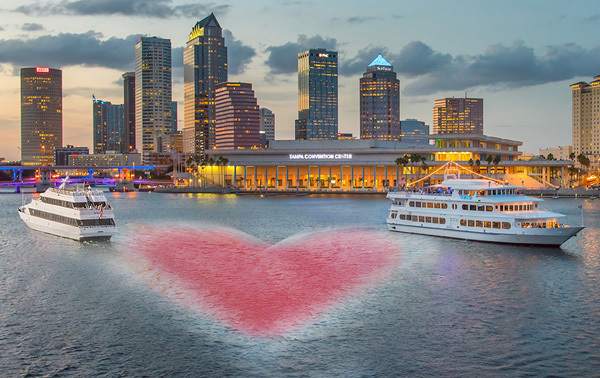 Sail along Tampa or Clearwater’s beautiful waterways with a delicious cuisine, intimate seating, great views and dancing under the stars. Book now to reserve your table! Valentine’s cruises are NON-REFUNDABLE and NON-TRANSFERABLE to another date. Black Friday and Holiday Sale Gift Certificates cannot be used towards Valentine’s cruises. Strawberry Salad: Mesclun Baby Lettuces with Strawberries, Hearts of Palm, Cucumber, Radish, Pickled Red Onion and Candied Sunflower Seeds with Balsamic Dressing.